Andromeda engulfed the Milky Way M32p to attain its massive size. Our Solar system is just a small part of the Milky Way. When we ponder upon strange happenings around us, we always start to think if there is more to what we know. We represent a small speck in our country, thousands of countries, seas, forests, and islands combined make our world. Going on, our earth is just one of the planets present in the solar system. As we move further away (in distance) from our earth, all the planets, the sun, numerous comets, asteroids, meteoroids, and the interplanetary medium combined makes our solar system. Traveling furthermore, we discover that our solar system is a tiny part of our galaxy considering the fact that Milky Way consists of billions of stars, a hundred million black holes, and interstellar medium other than our solar system. Is Milky Way the only thing that the infinite sky hold? The answer to that is obviously a big No. It is merely one of the galaxies present in the universe. According to the research of astronomers, there are more than one hundred billions galaxies in the universe. Out of all of them, there are few, which have always caught scientists’ eye. That list includes Milky Way and Andromeda. Both these galaxies are present in the local group. Additionally, both of them have the same spiraling quality. According to the latest research, Andromeda is approximately the same size as our galaxy but it was not always like this. It was much smaller in the beginning. The local group of galaxies included 3 galaxies as the Milky Way M32p was also there in addition to those mentioned above. It was considered a smaller sibling of our galaxy because they had some similar qualities. All three of them were spiraling galaxies and were known to twirl around each other for a long time. The Andromeda started coming closer to the M32p which eliminated the distance between them and finally a collision occurred. This collision caused the annihilation of Milky Way M32p and the Andromeda expanded. 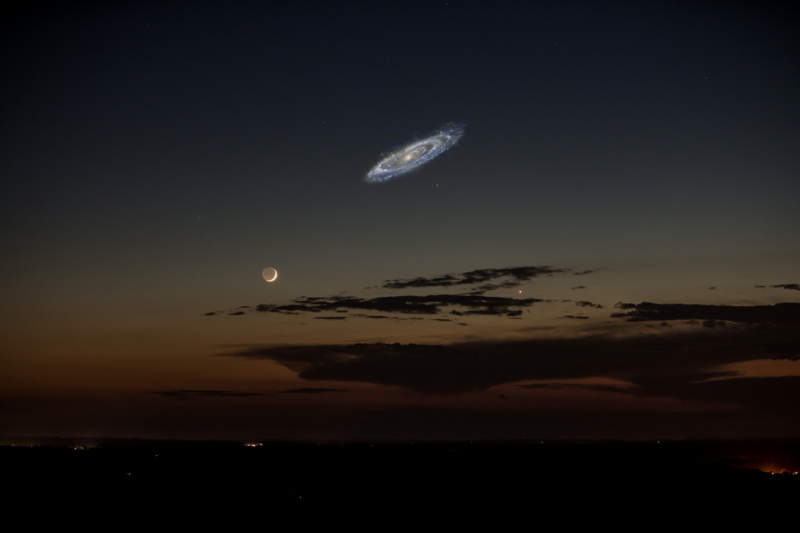 The real size of Andromeda Galaxy in the nightsky, if it was brighter. This discovery started to protrude when the scientists started digging around the Halo of Andromeda. They found the stars orbiting around as well as very dense satellite galaxy once known as M32p. Searching for more details and answers, the researchers came to realize something shocking. The faint halo of Andromeda was formed by its power to devour other galaxies. The scientists believed that hundreds of galaxies that Andromeda has demolished overtime formed this halo. Significant traces of evidence were left behind by the galaxies it had consumed and scientists worked on that information to deduce the properties of formerly largest galaxies before they were shredded. The stars present in the halo of Andromeda are roughly about 2 billion years old. These stars are composed of elements denser than helium and hydrogen, same as M32p. This points to the fact that a massive impact between Andromeda and Milky Way M32p did take place in the past which changed the outlook of the universe. Further investigations revealed that the former Milky Way M32p was the third largest galaxy which was present in the local group. Upon realization of this incident, it was a natural instinct that the researchers started worrying about our own galaxy. If Andromeda can demolish our sibling galaxy, our galaxy will not be such a big problem for it to annihilate. It was apprehended that The Milky Way and Andromeda were both hurling towards each other at 248,000 miles per hour. Does that mean it will collide soon? Yes, they will collide eventually but it will not be happening any time soon. Scientists claim that they would take four billion years to crash with each other. This as an outcome would form a new Galaxy, Milkomeda. Our Milky Way would undoubtedly become a portion of Andromeda’s enormous halo. By the time of impact, our sun would have packed an immense amount of heat. This means that it would have taken the form of a red giant by then and will destroy anything that comes in its way. All signs of life will be long gone and nothing much will be left for the clash to destroy.